Sarah Nader - snader@shawmedia.com Jim M'Lady, owner of M'Lady Nissan (right) hands he keys of a 2003 Grand Caravan over to Debbie Degraw (left) and Nancy Hiatt, president of Home of the Sparrow at M'Lady Nissan in Crystal Lake on Wednesday, May 2, 2012. M'Lady donated two vehicles to Home of the Sparrow. Once will be used as means of transportation for women staying at the shelter and the other will be used as a facilities maintenance vehicle. Sarah Nader - snader@shawmedia.com Debbie Degraw (left) and Jim M'Lady look on as Nancy Hiatt, president of Home of the Sparrow checks out the newly donated 2003 Grand Caravan at M'Lady Nissan in Crystal Lake on Wednesday, May 2, 2012. M'Lady donated two vehicles to Home of the Sparrow. Once will be used as means of transportation for women staying at the shelter and the other will be used as a facilities maintenance vehicle. 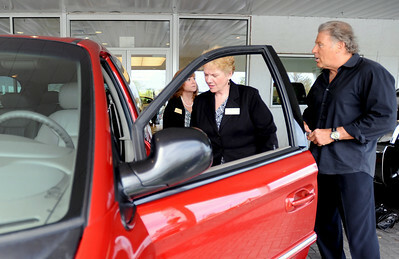 Jim M'Lady, owner of M'Lady Nissan (right) hands he keys of a 2003 Grand Caravan over to Debbie Degraw (left) and Nancy Hiatt, president of Home of the Sparrow at M'Lady Nissan in Crystal Lake on Wednesday, May 2, 2012. M'Lady donated two vehicles to Home of the Sparrow. Once will be used as means of transportation for women staying at the shelter and the other will be used as a facilities maintenance vehicle.